“Yankee in the South” gives us a 25-minute short film where the filmmaker walks through downtown Gatlinburg TN around 7 AM as it reopens to the public on December 9. 2016 after the great wildfire in the Smokies Nov. 28-29. The film is titled simply “Gatlinburg Reopens After Wildfires 12/9/2016”. Most of the town appears to be intact. The author shows many shops. There are attractions like Ripley’s Moving Theater. There is a pancake house. Some businesses are still closed because of smoke. At the end, he shows houses at the edge of town burnt to the ground, but the Mystery House was saved by hosing water constantly. There is mention of the “Tennessee state anthem” as he passes the Gatlinburg hotel. The film seems to be HD and has a curved effect sometimes, like a GoPro camera imparts. 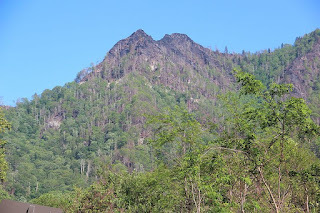 The fire had spread from the Chimney Tops 2 along US 441 (Wiki ) which I last drove myself in July 2013. I visited the town with my parents as a boy in the 1950s. Two juveniles were charged with arson for dropping lit matches near the mountain. But the fires would not have spread were it not for extreme drought, which could be related to climate change. Tennessee law does not allow for release of their names or much information before conviction, news story. But any blame for the juveniles would be mitigated by the slow response of authorities to the fire in the first couple of days when it was still small. Prosecutors have dropped charged against the teens. They do not have enough evidence that the teens really caused the entire fire, given weather conditions and extreme drought. Wikipedia picture of Chimney Tops TN N of US 441, PD .